How are these two power law fitting glm models different? I have some data that I thought I'd try fitting with a power law (in R). I tried fitting two glm to this model. In the first model, I log transformed both the independent variable "Depth" and the dependent variable "Value", and tried to fit these with a linear function. I also tried fitting the same data by not log transforming the independent variable, and instead fitting a log link function. When I examined values predicted by these functions, they seem to generate somewhat different predictions. I don't understand why these approaches would generate different predicted values. Could somebody explain to me why these yield different results? Furthermore, which model, if either is the correct approach? Why is power to detect interactions less than that for main effects? 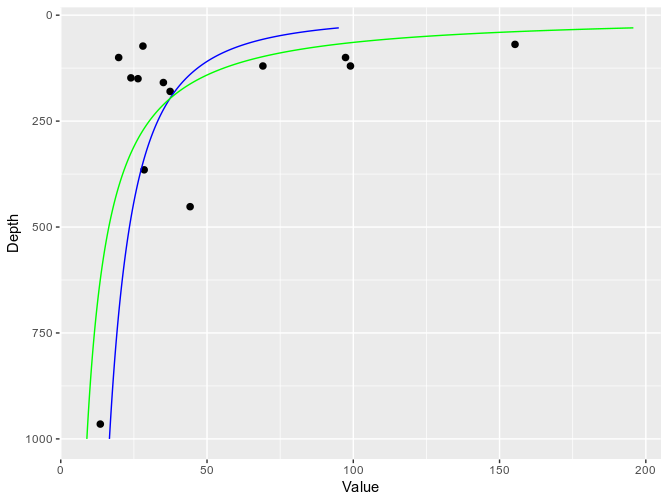 R: Fit curve to points by power law distribution: what model to use?